The Sturmhaubitze 42 Ausf. G (or just StuH 42 Ausf. 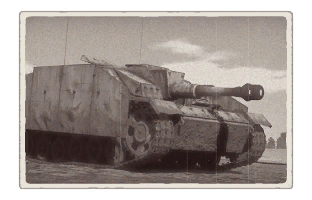 G) is a Rank II German tank destroyer with a battle rating of 3.0 It was introduced in Update 1.49 "Weapons of Victory". The StuH 42 is essentially a StuG III G with a 10,5 cm howitzer. While the StuH 42 bears much resemblance to the StuG III F and StuG III G, its play style is much, much different. While StuG is most effective at medium to long range combat, StuH is much more suitable for close to very close range. The reason is its gun - it is equipped with a large 10.5 cm howitzer. This gun has much lower penetration and shell velocity than that of StuG, but it can cause crippling damage with a single hit. Therefore, to be effective, StuH has to come very close to their opponents, to be able to hit their weakest parts of armour. Fortunately, its armour is reasonably good, at 80mm, and good mobility of Panzer III chassis now becomes even more useful. Suspension wheels are 15 mm thick while tracks are 20 mm thick. Sides of the tank are covered by additional 5 mm thick armour plates, protecting the tank against HEAT and HE shells, as well as reducing damage from nearby explosions. Belly armour is 30 mm thick. PzGr - Armour Piercing High Explosive - This is the main ammo type, use it whenever it has enough power to penetrate the target, as the explosive filler can make short work of a tank interior. FHGr - High Explosive round - Another very useful kind of ammo, can obliterate any unarmoured SPAAA vehicles or reserve tanks. But if used correctly can be quite effective even against very well armoured tanks - shoot them at the lower part of the turret front, or cupolas - explosion of the shell can then penetrate the deck/roof armour of the tank and cause extensive damage. It also often knocks out the gun and optics. Most penetrations will result in a knock-out 99% of the time. HI.Gr.38B - Cumulative Anti-Armour round - This one should be just skipped, it has no advantage over the better HI.Gr.38C. HI.Gr.38C - Cumulative Anti-Armour round - This shell has the highest penetration, but it is generally advised to not use it, as its damage effects are vastly inferior to both APHE and HE shells. They are also prone to detonate prematurely on spaced armour, or some debris in the flight trajectory. Their advantage is that they bounce less from sloped armour, and if they hit Fuel Tank or Ammorack, they usually detonate them reliably. Lastly, they don't lose any penetration over distance - carry only few of them in case they are needed. Ammo racks of the StuH 42. This vehicle is quite difficult to play because of its gun characteristics - it is forced to come closer to the battlefield, reducing effectiveness of its armour and risk being flanked. Therefore, it is recommended to never travel alone, always make sure the sides and rear are covered, and that there is some sort of solid cover to hide to during reloading. Its main role is either ambusher - waiting at favourable location for some unlucky enemy to come, or a direct support vehicle, helping other front line tanks deal with threat. Usage of hit & run tactics is a must, after firing it will take almost 19 seconds to reload, always get behind cover after each shot. Careful TD-style flanking is good idea as well, for the StuH it is no problem to quickly turn, move around a building and fire a devastating shot at its opponent's rear. But be very cautious when doing this, make sure the opponents are distracted by other threats, and won't turn their unwanted attention to the StuH too soon. Lastly - know the ammo and its characteristics - know what the 105 mm can penetrate and what it can't - try to plan the maneuvers and pick targets. Don't recklessly run face-to-face into a KV-1 tank, which is almost invulnerable to the gun. While certain shells are effective against various targets, switching them during combat is very problematic, because of its extremely slow reload speed. With its battle rating at 3.0 (all game modes), it will generally face early vehicles of late Rank I and early Rank II. The battle rating puts the StuH in a bit of a weird position; there are few tanks at that BR and therefore it is likely to be uptiered or downtiered. In an uptier, even to 3.3, most of the guns encountered will be reasonably dangerous, as most of them can penetrate between 90 and 100 mm of armour, versus the ~80 mm from the howitzer. However, in a downtier, there are five main enemies to look out for: ZiS-30, SU-76M, Char B1, M3 Lee and Crusader Mk III. The ZiS-30 has an extremely potent 57 mm gun, which is potent up to Rank III (!). The SU-76M has a (relatively) large 76mm cannon, which more or less acts the same way as T-34 cannons. The Char B1's 75mm is of most concern, but the 47mm is also powerful at close range. Its armour is quite hard to crack, especially with a howitzer. The M3 Lee carries a similar 75 mm gun as the M4 Sherman, which is dangerous from the front. The Crusader Mk. 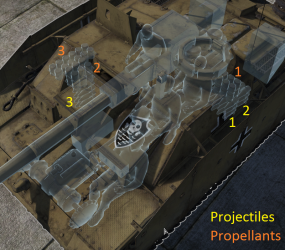 III's 57mm cannon isn't as powerful as the ZiS-30's, but still packs quite a punch. 105 mm howitzer with a variety of ammunition to use. Rather useful HE shell against thin roof armour or hull-break vehicles. APHE provides large amount of HE filler for devastating post-pen damage. HEAT rounds provide extra penetration power in cases of heavily armoured enemies. Gun has kind of a "fear factor", enemies often won't risk being hit by the 105 mm gun and back off from combat. Good frontal armour of 80 mm & low silhouette. Good mobility to get around the battlefield and into position. Very easy to destroy another StuH, simply shoot the thin sheet of metal sticking out of the top with HE. 105 mm howitzer performance lacking compared to 75 mm StuK 40 in penetration even with HEAT. HEAT damage lacking compared to APHE, trading off significant post-pen for penetration. Low reload speed, maximum of 13 seconds. Low accuracy (even at close range) makes weak spot targeting harder. Low gun depression of -6°. Very low shell velocity, less than 500 m/s. If the loader dies, the vehicle's reload rate decreases dramatically and the StuH becomes rather useless in combat. Huge ammo rack on the right side of the tank (and loader behind it) - clever players will often target this area. Lack of a turret means reacting to flanking enemies is harder. Cupola and machine gun shield on superstructure roof are weak points that can be targeted with HE to penetrate through the 11 mm roof top. The role of a self-propelled gun came from combat experiences in World War I. During the German offensives on the Allied front, infantry lacked artillery support against fortifications in places out-ranged by their heavy artillery behind the lines. A need for a mobile artillery piece was necessary to keep up with the German infantry and fight enemy fortifications with a direct-fire assault role. The father of this concept was German General Erich von Manstein and was coined as the Sturmartillerie (assault artillery), and these units were to be embedded in infantry divisions. The result of this concept was a vehicle known as the StuG III, a vehicle built on the Panzer III chassis that fits the role of a support vehicle in the artillery branch. It was meant to give close support to advancing infantry against fortifications or other lightly armoured oppositions. As such, it was initially armed with a 75 mm StuK 37 L/24 howitzer. However, as World War II progressed, the appearance of newer and better tanks such as the T-34 and the KV-1 tanks forced the Germans to upgun their existing StuG IIIs in order to be able to combat these tanks. This resulted in the StuG III design being armed with a 75 mm StuK 40 L/43 and L/48 cannon in the StuG III Ausf. F and Ausf. G respectively, turning the design into something of a tank destroyer. The StuG III designs are now bona fide tank destroyer, but an infantry support role was still needed from these assault gun to support the advancing infantry. In 1942, some StuG III Ausf. F were equipped with the 105 mm leFH 18 howizter rather than the usual 75 mm cannons. This variant was designated the StuH 42 (Sturmhaubitze 42, or "assault howitzer") and was meant to support the infantry with heavier artillery power than the 75 mm could provide. 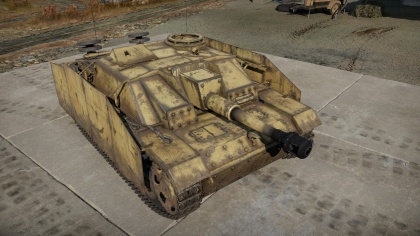 The StuH 42 was made from the StuG III Ausf. G chassis (though the first 12 were built on refurbished StuG Fs). About 1,300 of these StuH 42 were built between March 1943 to 1945. Based on Pz.IV Jagdpanzer IV · Panzer IV/70(V) · Panzer IV/70(A) · 15cm Sturm-Panzer 43(L/12) IV "Brummbär" · 10.5cm K18 Pz.Sfl.IVa "Dicker Max" · 8,8 Pak 43/1 Sf. "Nashorn"
This page was last edited on 4 January 2019, at 07:16.